Dr Vijay Mallya, chairman of the United Breweries Group and Kingfisher Airlines, is an exemplary entrepreneur, building multinational companies that span industries. Since becoming Chairman of UBG in 1984, Mallya’s has transformed it into a conglomerate comprised of 60 companies with interests in alcoholic beverages, engineering, chemicals, information technology, airlines, lifestyle, and more. 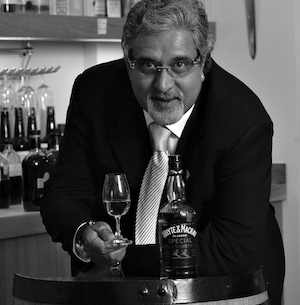 This year, United Spirits, his flagship company, became the second-largest spirits company worldwide. Now active in sports and entertainment, Mallya also owns the Bangalore team of the Indian Premier League as well as the Force India F1 team. Recently, Mallya took this passion for India’s growth and economic success to politics, serving as member of the Rajya Sabha. And in a patriotic effort to bring back Gandhi’s belongings to India, Mallya made a winning bid of $1.8 million for his remaining possessions. Mallya has proven to be a formidable entrepreneur, tapping into a series of industries, achieving success, and expanding his presence across continents.